The Prairie Brand is entirely organic, from start to finish, with every step of the process. The base spirit is distilled from dent corn, which is better known as the corn which is turned into chips, syrups, corn meals, in large part due to its high starch content. The grain is grown by a cooperative of farmers from across the state of Minnesota and makes its way into Prairie Handcrafted Gin via a partnership with the Phillips Distilling Company, who redistills the spirit with a classic gin botanical bill to create Prairie Handcrafted Gin. The nose isn’t too loud, with subtle hints of coriander and juniper, peppercorn and pine needles. Quite classic, but also quite restrained. Very nice, and classically inviting. On the palate, its rather clean and again quite classic. But I think it does a few things quite nicely. Piney, fresh juniper, dominating at a medium volume early. Gentle spice comes in later, starting cassia, turning coriander, and ending cleanly with a faintly mint tinged green juniper note. Medium length finish with very little heat, and instead a good amount of classic gin character. 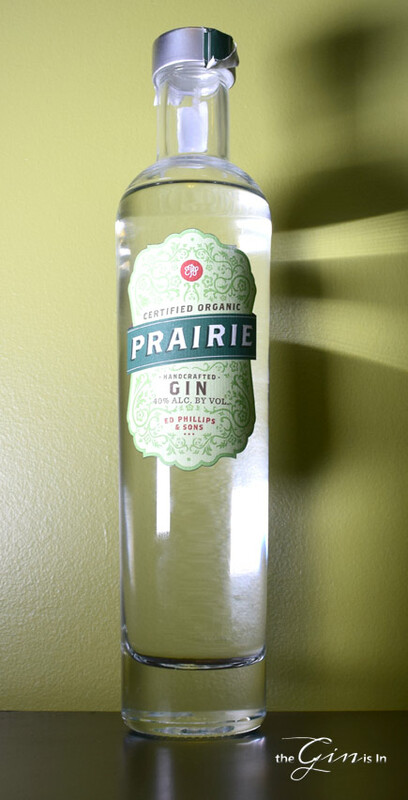 There’s nothing about Prairie Handcrafted Gin which pushes the envelope of gin. But for those in search of either a good United States Distilled classic gin or an organic classically styled gin, Prairie Handcrafted Gin deserves a worthy second look. Prairie Handcrafted Gin mixes well, though perhaps a little sedate flavorwise. Some of the mild flavor notes can be lost. I think it makes a refreshing, clean and classic Gin and Tonic, and although subtle it works nicely in an Aviation, adding juniper while letting the violet shine through. Great for a Gimlet or Tom Collins as well, this is a powerhouse mixing gin. Though I find it a bit boring in a Martini, the overall smoothness and pleasant mouthfeel carries the day. But sometimes, you don’t need to do anything radical to just be a good well-made classic style gin. Fans of the Beefeaters and Tanquerays of the world, may find a worthy addition to their cabinet (though more the former than the latter), while those looking for an adventurous break-the-mold sort of gin, are best advised to grab nearly anything else on the shelf.